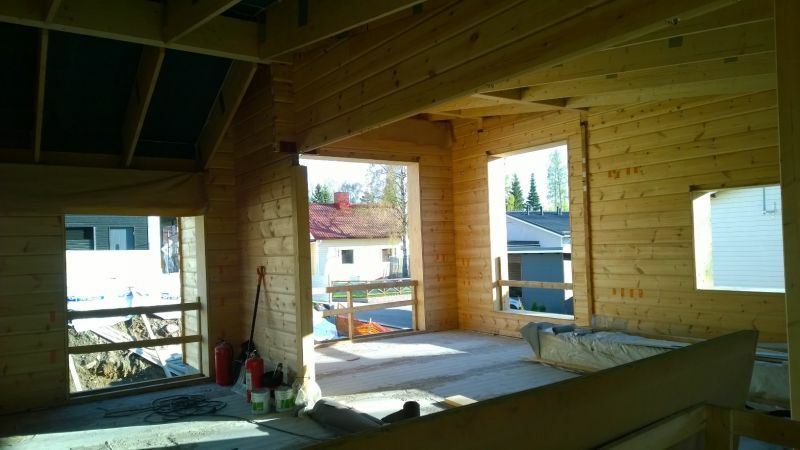 Double log wall makes possible to build log house with really good energy efficiency. In case there is really need to save energy, this construction makes it possible. For example U-value 0.13 will be reached using 260mm distance between log frames. When wood-fiber based insulation material is used, this wall also operates molecule level as like solid log wall. Difference is warmth: This wall is more than triple better insulation than 270mm laminated log. Even the logs itself are rather small, the house built from these logs most certainly do not look like it. The double log wall bases on 70x208 logs. The height of log (the side view) is just the same as bigger laminated logs. So the look of ready wall is just the same as the look of big laminated log house. The log ends will be hidden behind city-corner planks or laminated log corners. This finalizes the looks: In ready building there is zero “small” log ends visible. So nobody can see the actual log thickness, but you can feel the warmth. The logs we use in these walls do not include any glue or other chemicals. When the insulation material is wood fiber based the wall operates naturally and the breath of wall is possible. There is no limits to shape of house. Technology is suitable for every style. Mainly we use 70x208 logs and 202x208 laminated log ends but of course double log walls can be built by many other log profiles too. Logs ends are not obligatory, city-corners are of course also possible. - 20-30 % cheaper wall construction than thick laminated log. - Building time is about the same but need of crane is minimal. Big laminated logs need crane for every building day. -Yes, also internal walls by logs, and in reasonable price. This is not possible in thick laminated log houses, at least in reasonable price. Bearing beams of roof gives load also to internal walls according to the constructional plans. This stabilizes structure and keeps internal log parts tight.